Secret Chiefs 3: Band of Bands. That really has the perfect overbearing ring to it. When the "satellite band" idea was announced with 2004’s “Book of Horizons” it must have seemed like a pretty outlandish delusion of grandeur. That it certainly was. And a decade later the grandeur of the delusion has expanded beyond outlandishness to immanence. There are some who initially felt that the “Band of Bands” idea might just be a clever way to zoom in on and categorize different sides of the same eclectic band on one album. They would be right if the “satellite bands” remained inside SC3 albums, placed in various simple juxtapositions against each other. But when each band started putting out its own 7” releases these juxtapositions began to fall away. The plot thickened when it was announced that each band would be emphasizing the different sides of SC3 not just song by song but in depth on full-length albums. Next came the release of the first full-length from a SC3 satellite band, Traditionalists’ giallo-horror-inspired Le Mani Destre Recise Ultimo Uomini. Far from a ‘departure’ or a ‘side-project’, this seminal album of all original music from SC3 states primary themes found in alternate versions throughout the “Book of…” Trilogy, indicating that the polarity between ‘satellite' and ‘planet’ was not as simple as a primary/secondary relationship. In many ways this Traditionalists record is the highest peak SC3 has gone to in terms of orchestral writing and production, and some of the music has become a staple of the live concerts. With this new record the plot goes a giant leap deeper into the matter. If there was any lingering question about the ‘satellite bands’ being a phantom or ruse of the overactive imagination behind SC3, let these doubting thoughts now be confronted with the tangible arrival of Perichoresis, the second full-length of all-original music from a SC3 satellite band, this time from Ishraqiyun. Described as the Neo-Pythagorean Electro-Folk side of Secret Chiefs 3, Ishraqiyun has already been well represented on SC3 albums in the past. (Book of Horizons, Book of Souls: Folio A, Satellite Supersonic). On Perichoresis, which is comprised entirely of material not found on previous albums, followers of SC3’s live shows will recognize the Ishraqiyun repertoire of mysterious, catchy, original tunes. Historically the most prominent live incarnation of any SC3 satellite band, Ishraqiyun’s music is the stuff composed in ratio-based rhythms and utilizes non-western tunings & instruments (saz, sarangi, esraj etc). After persistently touring & playing this music at inordinately high volume to many adventurous ears over the last few years in over 40 countries, Secret Chiefs 3 now abruptly unveil definitive studio recordings of some of the this daunting repertoire. Of course, SC3 are never content to stay confined to the trodden path, so they have also included a healthy dose of new, previously-unheard tunes (actually half the album). Diverse musicians can be heard on Perichoresis. Ranging over several configurations of the band over the years, the players include Eyvind Kang (viola), Ches Smith (drums, percussion), Rich Doucette (sarangi, esraj), Peijman Kouretchian (drums), Mike Dillon (tabla), Shahzad Ismaily (bass), Timba Harris (violin), Jai Young Kim (keyboards) and many more, all led by of course SC3 composer/producer/bandleader/multi-intrumentalist, Trey Spruance (present writer). As yet there are three Ishraqiyun Song Cycles. These are clusters of compositions written around the same time, exploring often inter-related aspects of ratio, tonality and relationships in musical geometrics. Song Cycle 1, composed in 2003, includes the 4, Balance of the 19, Saptarshi, Bereshith, the 7 and S.I. Jophiel and an adaption of an Afghan tune (ironically the only equal-temperament song in any Ishraqiyun songbook) titled The 3. Song Cycle 2, composed in 2007/8, includes Brazen Serpent, Tistrya, Base Phive Futur Cossacks, Balthassar: Melchior: Kaspar (another adaption of an Afghan tune) and two as yet unheard original compositions. 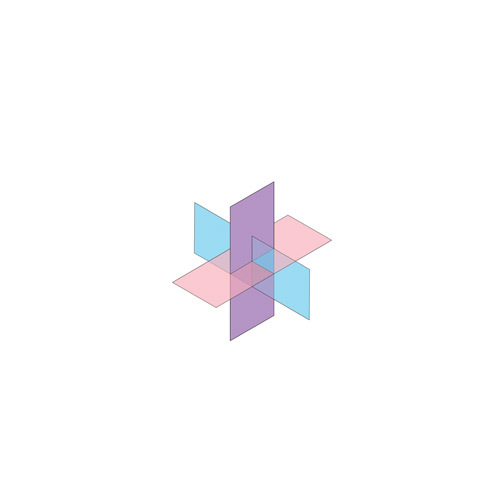 Song Cycle 3, composed in 2012-2014 is based on explorations of ’tessellating’ patterns derived from Platonic Solids and other polyhedra, applied primarily to the tetrachordal mechanics of the Kinnor/Lyre with compositions expanded therefrom. This Cycle includes Perichoresis, plus several pieces performed by Spruance, Eyvind Kang and Jessika Kenney in 2012, and many many other new pieces and systems being worked out presently. The present recording of “the 15," written in the first Ishraqiyun Song Cycle, begins on the bedrock of the original proto-first-ever (2003) recordings of Ishraqiyun. These involve Heifetz's drums (right channel) and the violin and viola of Kang. The next layer, from the 2005 version of Ishraqiyun, adds more Kang on viola, Mike Dillon on tabla, and Rich Doucette on esraj. The next layer, from the 2007 version of Ishraqiyun, adds Peijman Kouretchian on drums (left channel), Jai Young Kim on keyboards, Spruance on saz, and Rich Doucette once again, this time on sarangi. Additional saz, rebab and kinnor has been added recently along with all the complex studio inter-weaving to round out the production. For the ‘technically minded”, The 15 is a piece that variously embeds a slowed-down triplet and rushed 5-tuplet in the longer of two half bars that are in a 7:8 relationship. It really just means it slows down and speeds up in the same oscillating wave pattern, like a bouncing ball — much like any natural repetitive rhythmic motion. Nothing fancy, but rather native to anyone living life in gravity, as opposed to inside some squared-off silicone abstraction, or any of the other conceptual prisons we tend to confine ourselves to when creating music. The 15 was the first of many subsequent pieces written / expanding upon this basic idea. "Base Phive Futur Cossacks," from Song Cycle 2, was recorded mostly recently, although Ches' drums were recorded in 2008. Originally a dry exercise to coordinate a 7-note scale with non-western tunings with the remaining 5-notes in purely western intonation (a technique also developed in fellow Song Cycle 2 composition Brazen Serpent), "Base Phive Futur Cossacks" found a groove so deep that it eventually encountered the muse, grew wings, took on its own life and flew the coop. From the first Song Cycle, "Spiritus Intelligentiae Jophiel," popularly known as “fast,” is heard here being based mostly on the 2005 version of Ishraqiyun (much like The 7). Some of the encoded rhythmic mechanics of this piece are picked up and expanded upon, or de-coded and re-encoded, in 'Tistrya' from Song Cycle 2. That’s enough hinting at the deeper mystery embedded here. Purists will like to know that besides some tape-echo, nothing was altered in Eyvind’s solo section—even the accompaniment (Ches, Shahzad and Trey)-- all just happened that way in the studio. Stretching the envelope most particularly on this record is the mega-opus title track “Perichoresis”, from Song Cycle 3. This is the first recorded composition to introduce Spruance’s evolving system of musical ideas patterned upon specific geometrical relationships found in certain polyhedra, and some tesselating patterns derived therefrom. In fact the other pieces in Song Cycle 3 are more directly-related to polyhedra, whereas this piece takes a cue from the techniques discovered in the process, and applies them instead (with good reason) to several senses of the term 'Perichoresis'. The word derives from the Greek “chora”, or ’space’ / Latinized “khoreia” or ‘dance' (verb form “chorein”, ’to make room’, ’to go forward’), attached to the particle ‘peri’ meaning ‘around, about’ --as in perimeter, peristyle etc. There are three rhythmic layers of the Ishraqiyun piece that are ‘choreographed’, in ways mirroring the static sense of 'mutual-indwelling' described by the term Perichoresis in the early part of the term’s history. The composed music is but a static snapshot of a process that is itself endlessly dynamic (hence the verb form ‘perichoreo’ being more akin to a performance than a recording). In a comprehensive article on the subject, Danut Manastireanu writes, “Lampre translates perichoreo as ‘encompass’, ‘alternate by revolution’, ‘pass into reciprocally’. ‘It indicates a sort of mutual containing or enveloping of realities, which we also speak of as co-inherence or co-in dwelling. It is the dynamic process of making room for another around oneself.” How perfectly all this describes the structure and essence of the actual music presented here. With simultaneous time-signatures and motifs oriented around rotating vertices, all moving in graceful patterns around a central point on three coordinates ---delicate re-orientations of musical emphasis according to slight shifts in the movement of spirit, making room for other interpretations or ways of hearing or feeling a rhythmic pattern. With 3, 4 and 7-fold (and therefore 21 and 28-fold) symmetry (and oft-seeming asymmetry) one's hearing rotates and spins depending on which of the vertices has drawn the listener’s attention. Perhaps simply mirroring some small facet of the beauty of the Trinitarian dynamics (in what is really just primitive and profane music), even here the Stoic sense of “mixture” can be heard yielding to the more Nazianzan, Nyssan and Maximillian notions interpenetration, rotation and dance. Since the practical application of the theoretical/speculative basis of Ishraqiyun’s music has always been more akin to martial arts movement than cerebral music nerd-ism (it is assumed that Ches Smith’s many years of study of voodoo drumming has helped him assimilate this material naturally), the resulting impression of the music isn’t anything about “math” but is rather about being moved by (or moving with) the mysterious power of seemingly-lost fundamentals. It does’ t matter how forgotten or denied these fundamentals may be by modern culture, Ishraqiyun’s output is always tapped into them, perhaps moreso in this 17-minute mega-piece than in any other place (so far). Finally, the album closes with “Saptarshi.” From Song Cycle 1 this was the first of the Septentrion pieces. This recording, like The 15, is bedrocked upon a first layer consisting of Danny Heifetz’ drumming from 2003. Subsequent layers (guitars, sitar, percussion, synth bass etc) were added in 2011 and 2012 respectively. Keen ears might spot that there is already a 'proto-tesselations’ at work here, even a 'proto-Perichoresis' motif in some ways, embedded from the very beginnings of the first Ishraqiyun Song Book. 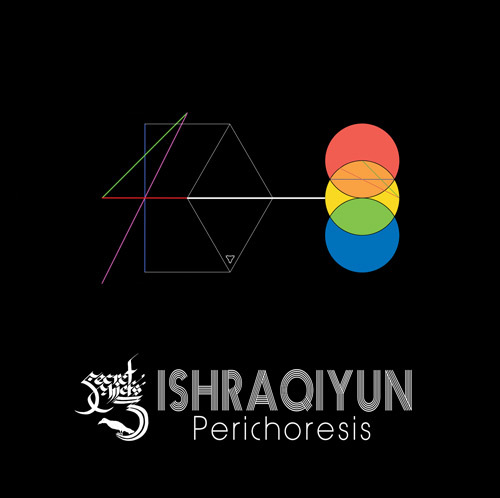 Order Ishraqiyun's Perichoresis CD now.